No Database Shutdown required to Clone, Overlay, Migrate, Convert 32 to 64 bits or copy Schemas Objects across Sun, HP, IBM & Linux Servers. Create Standby Databases & Mask confidential data. DbClone empowers DBAs, Developers, Mangers, and Users to smartly migrate, clone, upgrade, refresh and manage Oracle databases. Its Browser-based console makes it easy-to-use without DBA scripts. DbClone Web Console provides features to remotely manage databases, clone schema objects, and create Standby Databases easily with few mouse clicks. DBA Productivity & Business Continuity: It enables DBAs to securely delegate the repetitive DBA tasks to authorized users, without revealing database passwords It saves up to 75% of DBA's time spent in manually designing, scripting, implementing, and managing DBA tasks, thus freeing-up DBA for other critical functions like database backups and managing Standby Databases. 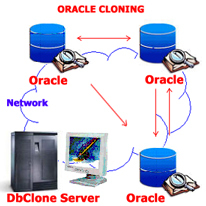 DbClone provides advanced functions and capabilities to automate and schedule common cloning tasks on Oracle databases during off-peak hours, thus eliminating the need for Oracle database outages and application shutdown during prime business hours. DbClone is Secure: DbClone is fully secure to automate DBA's complex tasks. It supports all current Oracle versions running on Sun Solaris, HP-UX, IBM AIX, and Red Hat Linux platforms. 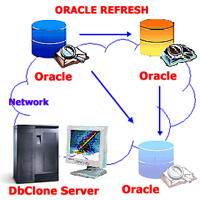 DbClone is ideally suited for large cross-platform migration of medium and large sized Oracle databases. DbClone checks, tests and certifies the completeness and integrity of delivered databases. Supports Rapid Application Development: DbClone provides advanced cloning functions to meet creation and cloning needs of development, test and Production databases for development teams It provides an quick and efficient roll-out of Production databases built from Development, Quality Assurance or User Acceptance environments. Management Tool: DbClone provides IT managers with the built-in web reports for Database Inventories, Health Checks, Inputs for Configuration Management, Backup status, Disk Storage usage, and DBA audit trails. It provides managers with easy-to-run web reports to get the status of large number of production and non-production databases for fast-paced IT environment.